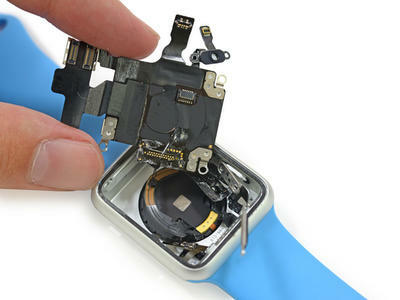 The Apple Watch has already received its customary teardown, but a new report takes a closer look at some of its miniature internal components. One interesting discovery is that the wearable's all-new S1 chipset employs a 28-nanometer Samsung processor. Inside the tiny 26mm x 28mm S1 package, there are 30 individual components, Chipworks has found. They include sensors like the gyroscope and accelerometer, the Wi-Fi and Bluetooth chips, an NFC controller and signal booster, and 512MB of RAM — as previous reports have revealed. What's interesting about the Watch's APL0778 processor is that it is manufactured by Samsung using an older 28-nanometer process. This is the same process used to make the A7 chip that powered last year's iPhone 5s, and it's no longer considered cutting-edge. In comparison, more recent devices like the iPhone 6 and iPhone 6 Plus have an A8 processor that was manufactured using a 20-nanometer process, while Samsung is now capable of making chips with a 14-nanometer process. In a nutshell, this means the Apple Watch's chip isn't as compact or as power efficient as it could be. Apple will likely use more recent manufacturing processes for future chips, however, and that could free up space for additional components on the logic board. Chipworks describes the S1 chipset as "quite an accomplishment." Let's consider its construction for a moment. We have a common motherboard to which all of the components (wafer scale packages, PoPs, BGAs, etc.) have been attached. The entire motherboard, with all of its components, is then overmolded with a packaging compound containing silica or alumina spheres suspended in a resin. We see this same type of material in conventional IC packaging, but we have never observed this being used over a 26 mm x 28 mm motherboard. Some of Apple's other partners for Watch include Texas Instruments, which supplies six components; Skyworks; Austria Micro Systems, and NXP. Interestingly, Maxim supplies the devices codec and amplifier sockets, but Chipworks notes Apple has been using Cirrus for these components for iPhone and iPads for several years.